Hi guys, no racing for me again this weekend (shame!) but I’m all booked up for the next couple of weekends! Whilst I’m really looking forward to the BRKC (only 68 days to go! ), I am already looking at entering some other races next year. 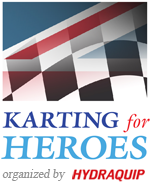 My sister-in-law(-in-law) sent me a link recently to a charity team endurance race, called “Karting For Heroes” (link: http://www.kartingforheroes.com/). This blog post is somewhat of a plea for two teammates, who can be experienced or inexperienced, but are willing to have fun and raise money for a very worthwhile cause. If you are interested in having a go, meeting new people and generally having a laugh, message me or leave a comment below. Also, if any of you hear of other rental kart races, please do give me a heads up and message me through the blog or leave a comment on any post!